Monday afternoon the world found out that actor/comedian Robin Williams died at his California home at the age of 63. While that news hit each person in a personal way, the overall collective grief reached the point of the President of the United States issuing a statement on the matter. When the POTUS is commenting about your death, that is when you know that you have reached the status of national treasure. Of course in Robin Williams’ case he portrayed presidents in several films so perhaps that helped garner the Oval Office tribute. Like many fans I never met Robin Williams and only knew him through his body of work which seemed to hit the mainstream right around the same time that I became aware of my surroundings enough to make and maintain memories. Once of those earliest Robin Williams memories involved Mork of Mork and Mindy fame. In addition to watching the show I was given a Mork figurine that had a backpack with a pull string that would playback numerous Mork sayings. I do not recall what happened to that figurine but I did enjoy it during the time I played with it. From Mork came the move from the small screen to the movies. 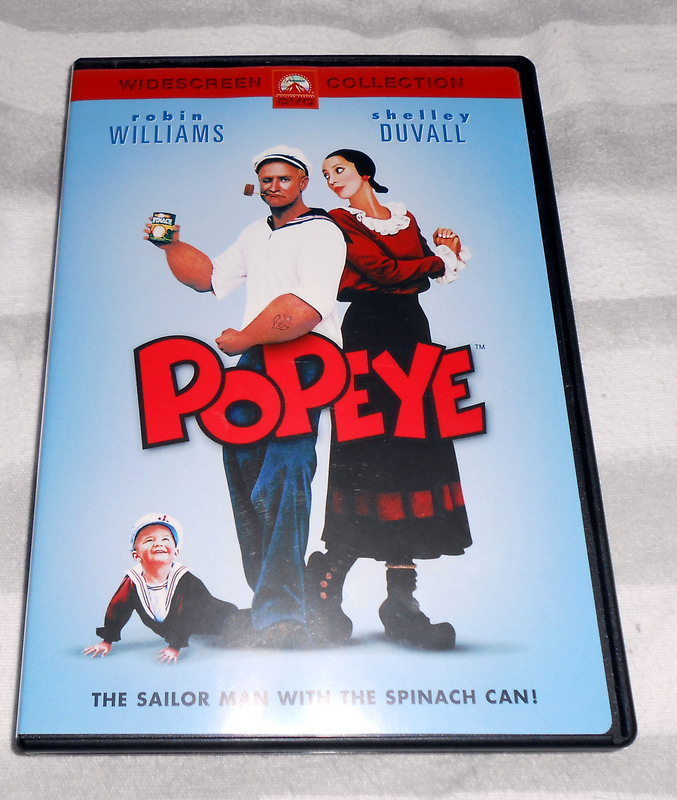 One such movie was Popeye. I remember my mom and I spent a whole day traveling from record store to record store trying to find the soundtrack to the movie because I had enjoyed the songs so much. Sadly we never found the album that day, or any day since for that matter. But the search was just as fun and created a lasting memory of an afternoon spent with my mom trying to give her son what he wanted. Robin Williams played many rolls throughout his career from a genie to a president but my best memories of him are when he was a sailor man. While my Robin Williams memories began in the late 70’s, every generation since has had a movie or a memory that they can cling to and call their own. For some the first memories of Robin Williams came in the form of a genie in a bottle from Aladdin. For others Robin Williams is Teddy Roosevelt from the Night at the Museum trilogy. Others still may have first discovered him in Mrs. Doubtfire, Hook, or Jumanji. Such is the transcending nature of Robin Williams and his career. He knew how to make us laugh and through is dramatic roles in Dead Poet’s Society, What Dreams May Come, and Good Will Hunting he knew how to make us cry. That dramatic turn earned Williams three Academy Award nominations and a Best Supporting Actor win for Good Will Hunting. Personally I think it was Dead Poet’s Society where he was truly Oscar worthy. Robin Williams also was a fixture in the world of Major League Baseball taking to the field before Game 1 of the National League Division Series in 2010 to cheer on the San Francisco Giants. The pep talk seemed to work as the Giants went on to win their first World Series title in 56 years. While Robin Williams never really did a baseball movie per se, it is during Good Will Hunting that his character talks about the Boston Red Sox and when it is necessary to chase after what is important no matter the cost. The bench where that scene was filmed has turned into a memorial as many fans share their grief showing that Robin Williams has the power to makes us cry once more with his unexpected passing. There will likely never be another actor/comedian like Robin Williams. Thankfully through the art of the movies his work will continue to entertain for generations to come. While fans are certainly entitled to their grief, I plan to focus on the laughter that Robin Williams brought me and many others throughout his life. With such a large group of movies to his name, and four more scheduled for release after his death, future generations will continue to experience the craft of Robin Williams long after the sadness of his passing has faded. In that way Robin Williams will never leave us just as the greats who passed before him still live on through their work captured on film. The passing of Robin Williams which has been attributed in early accounts to a struggle with depression highlights a bigger societal issue. As much as TMZ and trash journalism programs try to feed the public every sordid detail about celebrities, there is no way to know everything about them. Nor should we know every detail about celebrities. We live in a society where most people know more about people they have never met than their own neighbors. While a certain degree of knowledge is good even all of the information about celebrities does not cover the hidden struggles that many of them face. Robin Williams is not the first comedian to battle depression and he will not be the last. It is a cruel fact that many studies have shown that often times the people who makes us laugh the most, such as Robin Williams, are quietly crying on the inside. Other studies have shown that the more creative a person is the more likely they are to suffer from depression. It is almost like they need to have that internal strife in order to fuel the creative juices. Creativity and depression are certainly not limited to the field of comedy. In the world of music there are people like Kurt Cobain who used his battles to make great music that inspired a generation but ultimately fell victim to the depression that no amount of external success could quench. If there is some good to come out of the death of Robin Williams perhaps it is an awareness of the perils of depression and perhaps a call to find ways to help those who suffer from it. Another lesson to take to the Ballpark or the cinema is that as much as fans think they know the athletes or actors that they admire and cheer for there are other sides that are hidden from view. Often times these other sides are no different than anyone else. Celebrities still have to navigate personal relationships and put their pants on one leg at a time just like the rest of us; even if they have way more pairs of pants and assistants to help with that. The point is to never elevate celebrities to such a high pedestal as to make them appear invincible or to the point of believing that money buys happiness. By all accounts Robin Williams, much like Kurt Cobain and others, was a wealthy man rich with talent and adored by millions. But even with all of that going for him he could not overcome his depression. Now if you’ll excuse me, I think it is time for a Robin Williams movie marathon.